Fruitfusion 6mg gum. Size: 2 x 105 pieces. We have over 10 years of experience in the Health & Beauty category. City Color. All our products are sourced either directly from the manufacturers or reputable distributors. Freshmint 4mg nicotine gum. Size: 2 x 105 pieces. We have over 10 years of experience in the Health & Beauty category. City Color. All our products are sourced either directly from the manufacturers or reputable distributors. Condition is New. Fruitfusion 6mg gum. Size: 2 x 105 pieces. 6mg Nicotine. New Extra Strength 6mg. Actively fight your toughest cravings with new 6mg gum – the strongest gum available. Nicorette Gum is used to relieve and/or prevent withdrawal symptoms and reduce the cravings you get when you try to stop smoking or when cutting down the number of cigarettes you smoke. Nicorette microtab 2mg 100s (G). Nicorette microtab 2mg nicotine low strength dissolves to relieve cravings and nicotine withdrawal symptoms. Contains nicotine. Requires willpower. 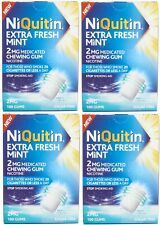 Niquitin Minis 1.5mg 60 Mint Lozenges Brand New Long Expiry Date NEW . Condition is New. Dispatched with Royal Mail 2nd Class. 2mg - original FLAVOUR! 210 Pieces! This is a charity sale. No warranty. Price reflects this issue. We do not regulate those prices. Freshmint Gum. 2mg -105 Pieces. 4mg -105 Pieces. Improves Teeth Whiteness. Icy White Gum. 2mg Coated Gum. Nicotine Withdrawal Symptoms. 105 Pieces. Nicorette Original Gum 2 mg, 210 Pieces brand new long expiry date(new packagin) Please note this item will be sent flat packed if ordered one box Thanks for your purchase. Nicorette Cools Icy Mint 4mg Lozenge Nicotine 4x20 Lozenges 06/2021. Condition is New. Dispatched with Royal Mail 2nd Class. Nicorette Gum is used to relieve and/or prevent withdrawal symptoms and reduce the cravings you get when you try to stop smoking or when cutting down the number of cigarettes you smoke. It provides a safer alternative to smoking for both the individual and those around them. 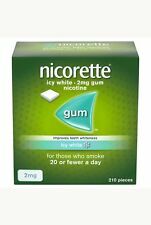 Nicorette Freshmint Sugar Free Gum 2mg Nicotine 210 Pieces. NICORETTE Gum is available in Freshmint, FreshFruit and Icy White flavours - all three are double coated for an enhanced flavour experience.